ClearView Geophysics Inc. - ClearView Geophysics Inc.
ClearView Geophysics Inc. owns and operates transient PROTEM receivers and TEM57/67 transmitters built by Geonics. This system has proven itself useful for detecting both good and bad conductor sulphide mineralization located both shallow and 100’s of metres deep. It is also useful for detecting sources of water. 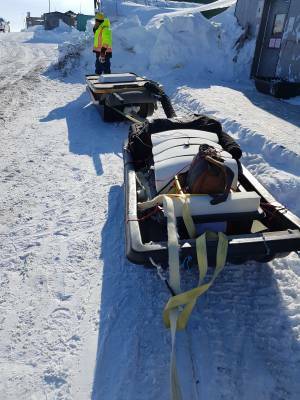 Cesium magnetometer surveys are carried out using a custom-built sleigh pulled behind a standard snowmobile. This system has proven itself on numerous large-scale mineral exploration projects during the past 15+ years. Seismic Refraction surveys are typically carried out for depth to bedrock investigations. The "shot" can be either an explosive or hammer source. Interpex IXRefraX software is used to process the data. 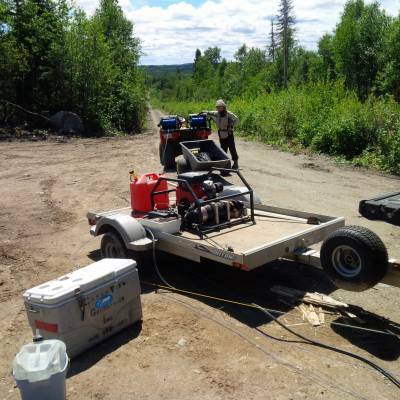 EM and Magnetic surveys are perhaps the most common geophysical methods used on mineral exploration and environmental investigations. The most commonly used EM instruments for environmental investigations are the Geonics EM31 and EM61. 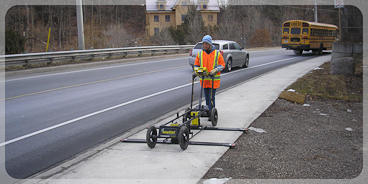 GPR works best in low conductivity areas. 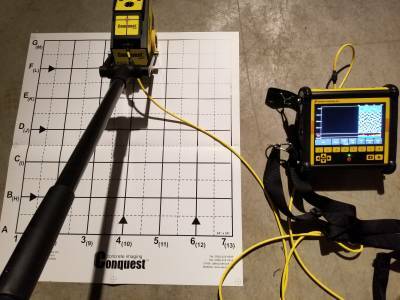 Conductive materials (e.g., clay) attenuate the GPR signal to the point that very little depth penetration is achieved. Penetration is greatest in unsaturated sands and fine gravels. 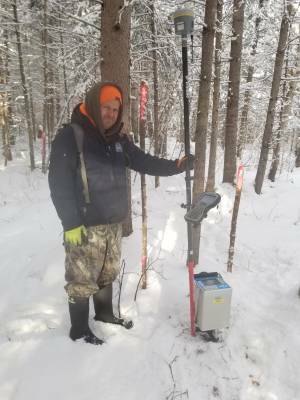 Gravity surveys are completed for a number or applications, including mineral exploration (e.g., diamonds) and geotechnical investigations (e.g., escarpments). 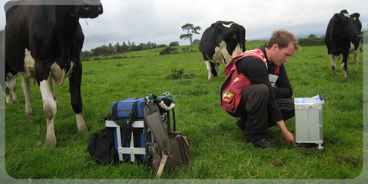 ClearView has extensive experience interpreting airborne and ground-based geophysical data. We use UBC's suite of inversion software to produce 2D and 3D interpretations of total field magnetics and IP/Resistivity data. Post-processing software is also used to produce various derivative datasets and maps. 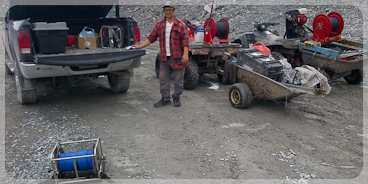 ClearView Geophysics Inc. is a geophysical services company founded in 1996. There is no better way to collect high resolution sub-surface data than with ground-based sensors or 'boots on the ground'. When you describe your project goals to us, we will design a geophysical survey to help you achieve those goals in the most cost-effective manner possible. 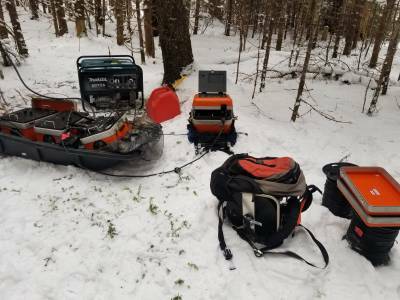 Getting ground-based geophysical data is arduous - so we are constantly working to find ways to make it easier, whether its with our snowmobile- and ATV-mode surveys or with exo-skeleton systems for more supportive and safer fieldwork. 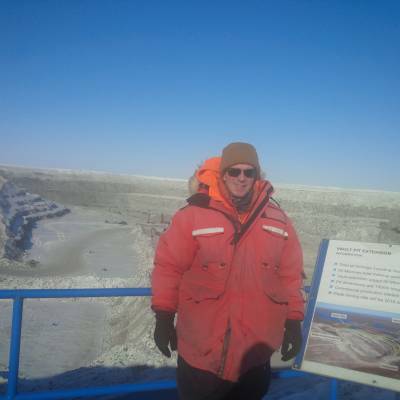 About the Owner: Mr. Mihelcic is an Applied Science '88 Geological Engineering (Geophysics Option) graduate of Queen's University at Kingston and '95 MBA graduate of Ivey Business School at the University of Western Ontario in London. He enjoys designing and implementing off-the-shelf components and technologies to make ground geophysical surveys easier and therefore more cost effective. He also writes his own software to streamline processing and interpretation. Gravity Surveys are used for many applications, including gold, base metal and diamond exploration. 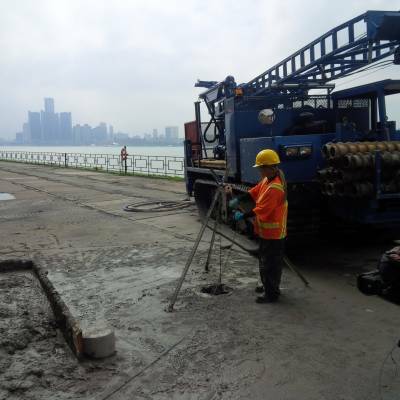 For geotechnical applications it can be used to detect buried bedrock escarpments, for example. Cross-hole IP/Resistivity Surveys are carried out with C1-C2 transmitter current electrodes at 'infinity' perpendicular to the target strike and on each side of the target. P1-P2 electrodes are placed in the borehole pairs and read in a semi-tomographic mode. A third electrode is typically positioned at one of the collars for quality control and to monitor the transmitter current as the surveys progresses. ClearView owns and operates a Sensors & Software Conquest 100 System for concrete scanning services. This compact 1 GHz GPR instrument includes an added-on power cable detector. Joe Mihelcic attended the symposium in Iqaluit and met many interesting government, business and local leaders. 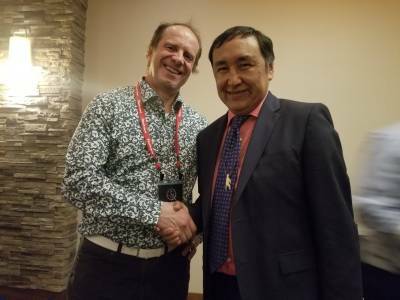 Joe with Paul Okalik - Nunavut's first premier. Large Loop TDEM Surveys for base metals, uranium and graphite. 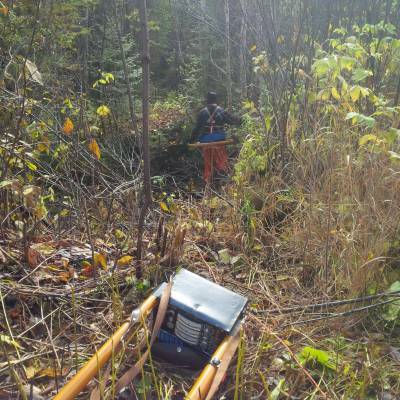 ClearView Geophysics Inc. carries out large loop TDEM surveys for base metal, uranium and graphite exploration using Geonics PROTEM receivers and TEM57 transmitters with TEM67 power modules. Low frequency 3D coils or fluxgate sensors are connected to the receiver to measure the responses. Borehole surveys can also be carried out with BHEM probes. The IMAGEM system is a state-of-the-art high resolution time-domain system that is capable of recording 200 channels of on- and off-time EM measurements. Geotechnical engineers require accurate parameters for designing buildings, foundations, rock slopes and so forth. The shear-wave velocity of the ground is a useful part for determining common geotechnical parameters such as Poisson's Ratio and Shear Modulus. 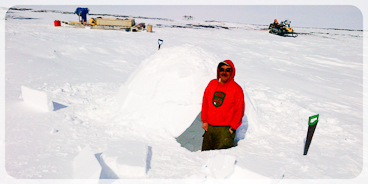 ClearView is in the arctic carrying out snowmobile-mode geophysical surveys. These surveys are faster than walking mode, safer, more accurate, higher quality and much higher resolutions than airborne surveys. The project this year is focused on helping exploration geologists pick near-mine targets for further evaluation. 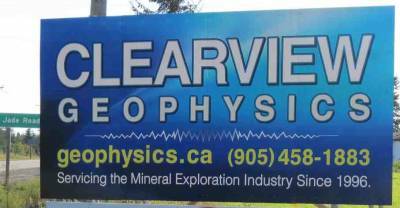 ClearView Geophysics Inc. is 20 years old! 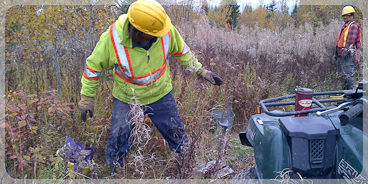 We are proud to say that ClearView Geophysics Inc. has provided professional geophysical services for mineral exploration, environmental investigations and geotechnical applications since it was incorporated in 1996. ClearView was founded by Joe Mihelcic, geophysicist, after completing his MBA at Ivey Business School in London, Ontario. Since then, ClearView has employed and trained dozens of high-calibre geoscience students, technicians, engineers and specialists. The company was established to allow greater flexibility in applying customized solutions. Sometimes the simplest and most inexpensive methods from Civil 101 can provide surprisingly high accuracy vertical positioning. 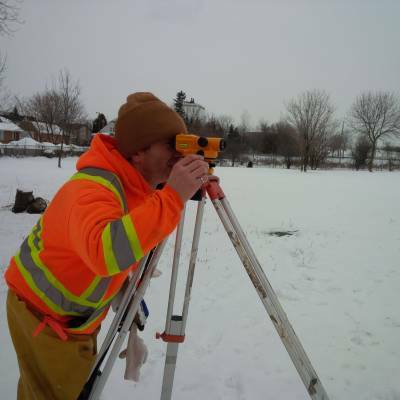 ClearView recently completed an elevation survey to complement a complex series of geophysical surveys at a site in Southern Ontario. The elevation data was used to provide 3D capabilities for presenting the geophysical data. 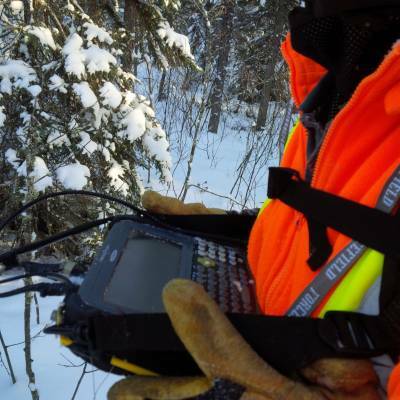 A pair of Trimble ProXT GPS receivers were used to provide accurate temporary benchmark data. The level survey data closed to less than 1/8 of an inch over 700 metres in both directions through the 1400 metres long survey area. 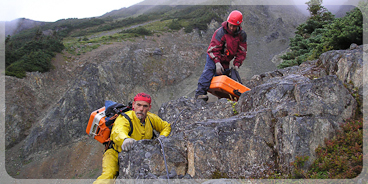 MaxMin by Apex is a mature method used over many decades for mineral exploration. ClearView is presently applying the method on a gold exploration project to see if it can detect subtle quadrature (out-of-phase) responses that might indicate stringer mineralization, faults or geologic formation variations. There are many types of 'targets' that geophysics can be used to detect. For exploration, targets can be gold, base metals, speciality metals, diamonds and sand/gravel deposits, to name a few. Each target type has its own unique response to geophysical methods based on its local geologic environment - this is called its 'geophysical signature'. 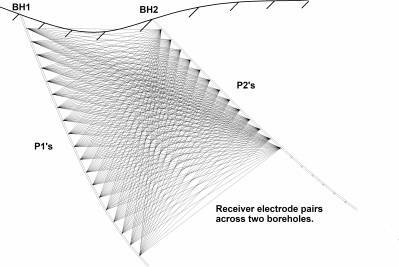 The Dipole-Dipole electrode configuration is ideal for detecting off-hole targets because the transmitter and receiver electrodes are always at the same distance apart as the configuration moves down the borehole. This makes detecting anomalies easier because if there weren't any, the resistivity profile would be flat in a uniform half-space. 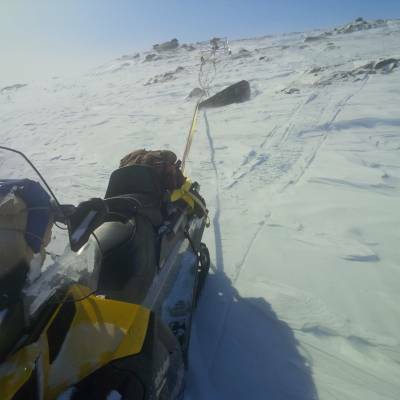 Snowmobile-mode surveys can be used with different geophysical techniques. Our flagship survey is the cesium-magnetometer survey - almost continually applied and operated in the arctic on small and large-scale projects at spring-time personally by Mr. Mihelcic since 1996. Only the mag sensor and GPS dome are on the sleigh separated by 1.7 metres. Post processing corrections using in-house software correct for this layback and a 0.33-second system latency which is confirmed by speed tests done over anomalies in both directions. 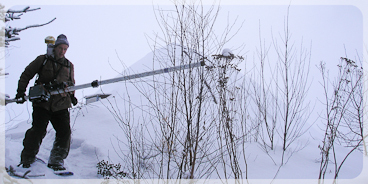 The tried and true un-manned aluminum sleigh is located far back from the snowmobile. 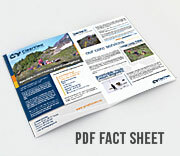 It has proven durable in boulder fields, steep terrain, extreme cold and wet conditions. These design features, fine-tuned over 20 years, give extremely low heading errors - far better quality than walking mode and certainly higher resolution than any airborne survey. Productions rates of 40-80 km per day can be acquired depending on terrain, with readings at 10x per second. This spring we applied a combined cesium-mag and TDEM system on a large-scale project in Nunavut. ClearView is a registered member of ISNetworld. 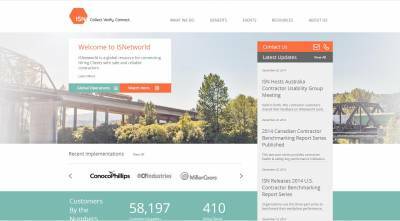 Many clients use ISNetworld to choose their suppliers so that they can be sure all requirements are met. For example, ClearView carries $5-million coverage for commercial liability and professional insurance. Ground Cesium-Mag 50-m lines trumps Old-School-Mag done on 100-metre lines. Many cesium magnetometer surveys are carried out without cut lines. The onboard GPS is used for navigation and positioning. Data are recorded at 10x per second. Therefore, lines are spaced 50-metres apart in areas where drills are standing by. This allows for the interpretation of 'breaks' in the mag which can act as conduits for gold and other economic mineralization. Gone are the days where traditional 'proton precession' style magnetometers are used for serious high resolution and high quality data. IP/resistivity survey lines can be 'targeted' to specific areas (e.g., breaks in the magnetics contours) to reduce costs by exploring more efficiently! ClearView completed several 4-Pin Wenner Array surveys as per ANSI/IEEE Std. 81-1983 and others as a guide (i.e., IEEE 80-2000 and ASTM G57 for soil resistivity test). 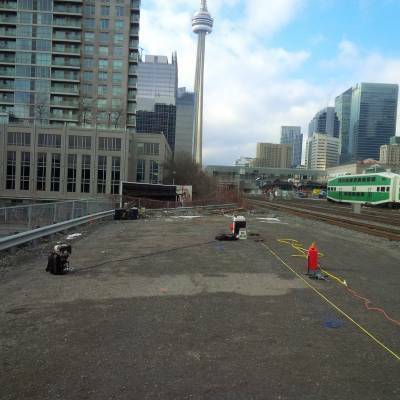 The work was carried out so that appropriate electrical grounding design for planned facilities within highly congested industrial areas in downtown Toronto could be done. 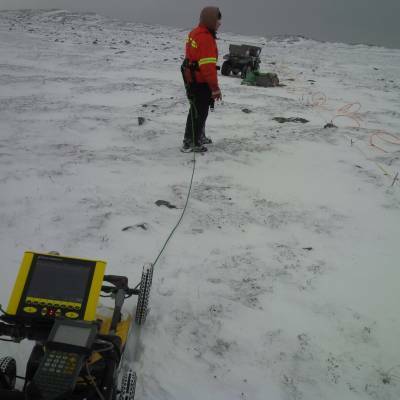 ClearView Geophysics recently completed Resistiviy Imaging, EM, and GPR surveys in the arctic. The purpose of the work was to determine depth to bedrock and areas of potential frost heave from ice wedges to assist with plant design and construction. The work was done with multiple GPR frequencies and resistivity electrode spacings using a Syscal Pro with 96 electrodes. 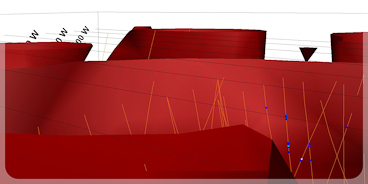 This combined-methods approach, typical on ClearView projects, makes it possible to provide a more definitive interpretation of the sub-surface. High near surface resolution and good depth penetration to over 60 metres were obtained over an area of 25 hectares in less than 2 weeks. Field office and equipment base set up near Kirkland Lake, Ontario. 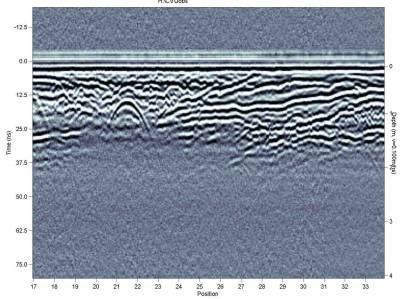 500 MHz, 250 MHz & 100 MHz GPR scans now standard on most shallow investigation projects.